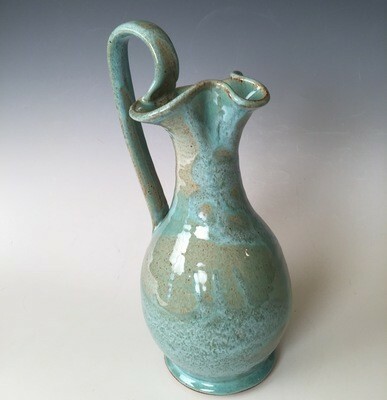 Miracle Pottery Rebekah Pitchers are made from high grade stoneware clay body and glazed with high fire glaze in many of our favored glaze colors and patterns. The design is our rendition of what type of pitcher would have been used to draw water from a well during the time Christ walked the earth. As the Biblical story relates, Abraham was in need of a wife for his son Isaac and wanted the favor of the Lord. The Lord spoke to him and told Abraham that he would know the right woman for his son would be the woman who would offer to draw water from the well for not only himself but for his camel also. The pitcher would be able to be lowered into even a nerrow well, have had a handle that would allow it to be filled to the brim easily and be easy for a woman to carry on her shoulder. 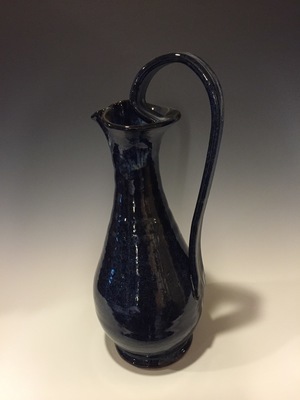 The Rebekah Pitcher also has a handle that when the hand is slid lower to the base creates a balance when tilting to pour making it effortless.